The mobilization of international and Palestinian-Israel pressure to support Susiya and prevent the demolition of half of the village was remarkable. The US State Department and EU foreign ministers warned Israel against further destruction and expulsion, and the demonstration on July 24th in support of the village was the most significant Palestinian-Israeli rally for years. That so many eyes were on, and bodies in, Susiya is testament to the determination of the people of Susiya to remain steadfast on their land, and of the support they receive from the Palestinian Popular Struggle Coordination Committee, Rabbis for Human Rights, B’tselem, Breaking the Silence, Combatants for Peace, Ta’ayush, and others. News came that the “Civil Administration” of the military occupation decided to hold back on the demolition, and that the High Court hearing to appeal the demolition was being delayed while some other arrangement for the villagers to stay on their private land is considered. So for once there was some good news. Susiya remains to live another day, and the Occupation is held at bay. But the news didn’t stay good for very long. It was a spark of hope in what remain dark times. The same week the Israeli security apparatus shot dead three unarmed Palestinians when soldiers went on arrest raids. Palestinian lives matter. The settlers did not let up on their efforts to grab the land of Susiya for their own use. In any case, Susiya has not yet been saved, merely given a reprieve. 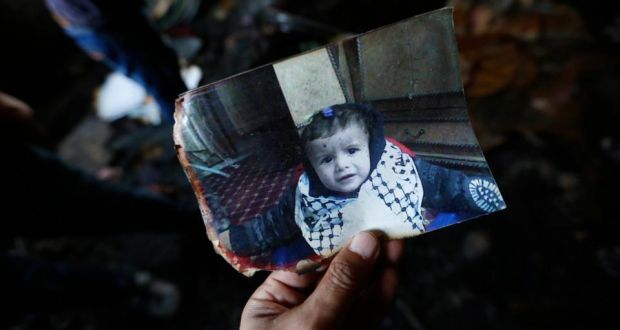 Then the news became horrific, with the burning to death in an arson attack on his family’s home, apparently by militant settlers, of 18-month year old Palestinian Ali Dawabsheh. At the site of the attack in the village of Duma, graffiti was painted, including the word “revenge” under a Star of David. Israeli Prime Minister Netanyahu, Defense Minister Ya’alon and President Rivlin were quick to condemn the attack, even to call it Jewish terrorism, and to promise that the criminals would be brought to justice. They were also quick to draw a clear distinction between such extremism and the regular practices of the security forces and state without which the settlements, which are illegal according to international law (and some by Israeli law) could not exist. Palestinian President Abbas however saw the connection between them. And so he should, although it would also be good to see the resources of the Palestinian Authority put to use in support of the harassed Palestinians living under full Israeli military and civil rule in Area C.
The village of Duma, near Nablus, has not been forced to relocate itself as Susiya did in 1986. Nor is it facing any immediate danger of dispossession and dispersal. But the military-bureaucratic post-Olso occupation regime, as reported here, has left the village of Duma isolated among settlements and army bases, restricted movement with roadblocks, limited access to most of its land that is located in Area C, ordered the demolition of homes built in the part of the village located in Area C without the required permits that are almost never given, confiscated land for roads that connect Israeli settlements, and failed to protect it from numerous settler attacks. The revenge attack is made to seem exceptional, its violence impassioned, whereas the routine structural violence of occupation that Netanyahu and Ya’alon practice is made to seem proportionate and justified. Homes of the Dawabsheh family were slated for demolition by the occupation authorities in 2013. Ali Dawabsheh’s murder (and that of any other members of his family who may not survive their severe wounds) is indeed exceptional in its viciousness. But to treat it as a homicidal exception to the politicide of occupation is an alibi for the viciousness and extremism that is the daily practice of governing people without rights whose lives simply don’t matter to their rulers. Occupation is a revenge attack for no crime that was committed by the people of Susiya or of Duma. Occupation is a revenge attack that condemns both those who can find no salvation in vengeance and those who are the target of their misdirected fear and hatred. This entry was posted in Anti-occupation, Protest and tagged Ali Dawabsheh, B'tzelem, bibi netanyahu, Breaking the silence, combatants for peace, Duma, Israel/Palestine, Moshe Yaalon, Popular Struggle Coordination Committee, Rabbis for Human Rights, Reuven, Rivlin, Susiya, Ta'ayush on August 2, 2015 by Jon Simons. It’s difficult to picture peace, and so more often than not the Israeli peace movement is working against the current situation – most easily summed up through the expression “occupation” – rather than for the desired outcome of peace activity. The Hebrew term for occupation – kibbush – also means conquest, so it makes sense that “peace” can’t be the “quiet” that follows conquest. At present, such relative quiet is the sort of peace that many Israelis (mis)take for peace, and so various peace groups are busy trying to get the public to see that there is no quiet in the Palestinian occupied territories and that the conquest is still going on there, every day and in their name. One such group is Shovrim Shtika (Breaking the Silence), “an organization of veteran combatants who have served in the Israeli military since the start of the Second Intifada and have taken it upon themselves to expose the Israeli public to the reality of everyday life in the Occupied Territories.” The core of their activity is their testimony, recorded on video and in text, available on their web site, but they “also conduct tours in Hebron and the South Hebron Hills region, with the aim of giving the Israeli public access to the reality which exists minutes from their own homes, yet is rarely portrayed in the media.” And so having read about the current situation in this southern area of the West Bank sometimes on the pages of the liberal Israeli newspaper Ha’aretz and more often on more often the various blogs such as +972 and peace group web-sites, such as Ta’ayush (an Arab-Jewish partnership group), I joined one of the tours to see with my own eyes. The highlight of the tour was a visit to the Palestinian village of Susiya, whose plight – facing demolition and elimination by the occupation – has been covered elsewhere, including on a campaign blog that is mostly in English. On the day of our visit, the first day of the intermediate, hol hamo’ed period of the week-long Succot festival, the busy part of Susiya was not the village but the archaeological site of the ancient synagogue into which buses and cars full of Israelis were streaming. Symptomatic of the cynical legalism by means of which the Israeli military occupation is conducted, the Palestinian residents of Susiya who had been living on what was discovered (by a military archaeology unit!) to be an historical site had been displaced – as it’s forbidden to live on an archaeological site. But sure enough, the site soon included a few residencies for the Israeli staff of the site. It was a quiet day for Palestinian Susiya. There were no demonstrations, no military presence, no settlers, just a small group of sympathetic and curious Israelis and a sun insisting on it being late summer rather than early autumn. The conflict seemed a long way away, and one person on the tour said as we left, there seemed to be plenty of room for everyone. Why should Palestinian Susiya have to go even if the Jewish settlements were there to stay? But as he led us around the village, accompanied by a couple of its residents, our guide Ayal described the place as a “museum of the occupation”. And indeed, juxtaposed to the archaeological site on the other side of the road, were the archaeological remains of the destruction of Palestinian Susiya. The photographs I took are hardly the most dramatic images of recent events at Susiya, many of which can be found at the ActiveStills site, showing clashes between military and settlers on the one side, and residents and activists on the other. Nor are they the best photographs for showing what daily life is now like in Susiya, of which there are many taken by its women residents, which can be seen on the Susiya Forever blog. What they do show is what is left after the destruction by military bulldozers: a blocked well which now can’t be used for drinking water, but from which a thin pipe leads, providing some water for animals and irrigation; a cave dwelling with its stone roof torn off, being reused as an animal pen. The residents of Palestinian Susiya thus all live in an archaeological site that is a testament not only to the destructive power of the military occupation but also to their determination to remain. Their stubborn attachment to their land – where else can we go, they say, when asked why they don’t give up – obstructs the construction of a false image of peace, of peace after the conquest when the land has been cleared of Palestinians. The picture of peace in this scene is not only in the negation of the ruin wreaked by armed force, but also in the presence of the Palestinians on the land, living among ruins, so that one day they won’t have to. This entry was posted in Anti-occupation and tagged Breaking the silence, Israeli peace activism, israeli peace movement, middle-east, South Hebron hill, Susiya on October 5, 2012 by Jon Simons.